May the road rise up to meet you is the blessing on this Irish plaque. As a wall plaque this Irish blessing is ready to hang, but you may also use it as an Irish stepping stone in your garden. This Irish garden stone is complete with Celtic knot-work along with a blessing and it is made of green resin with gold accents. 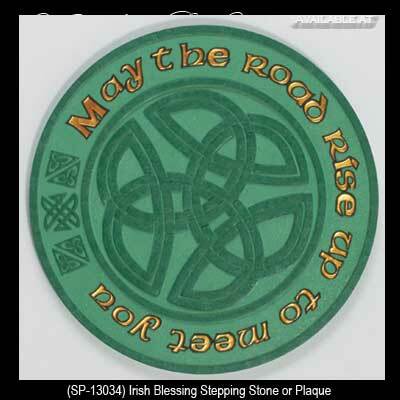 The Irish blessing plaque is suitable for either indoor or outdoor use and measures 9 1/2" diameter. The Irish garden decor is gift boxed with a Celtic knot history card, complements of The Irish Gift House.